I went on decks with the mop as the sunny day had also been accompanied by a heavy dew and it was a lovely quiet, warm and sunny start to the day back here in Norfolk. We did not have to be in any hurry today, as the boat outside us, ‘Popping Corks’ was not leaving until after 2pm and so we lazily enjoyed our breakfast of muesli on deck and then we walked into Lowestoft to have a look around. We stayed in the pedestrianised shopping centre for the most part, the more civilised part of the Town, and looked in a few shops and bought some bread and Eccles cakes from the bakers and then I walked Kathleen and Ines back towards the sea to stop at the Theatre Café, where we enjoyed some cakes and teas together before returning to the yacht club and re-boarding Lady Martina. 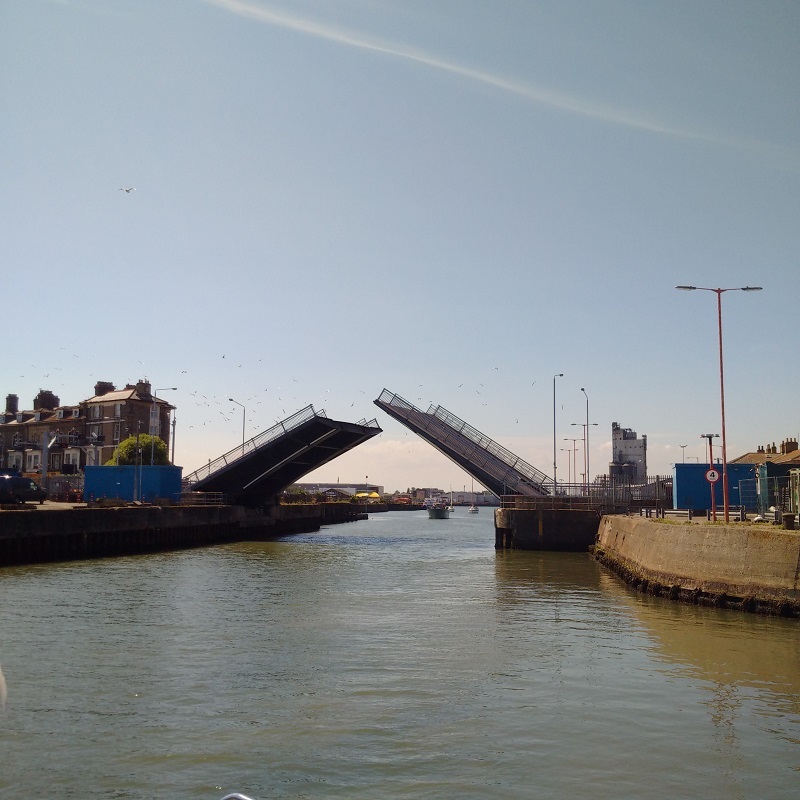 I had checked with the boat next door and the Oulton Broad Yacht Station and arranged that we would cruise upstream with Popping Corks and another boat that was due to lock through Mutford but stay on the waiting pontoon once I had navigated past the lifting rail bridge. And so, around 2.00pm, I started the engines and then cast off and made my way into the bridge channel to await the others. 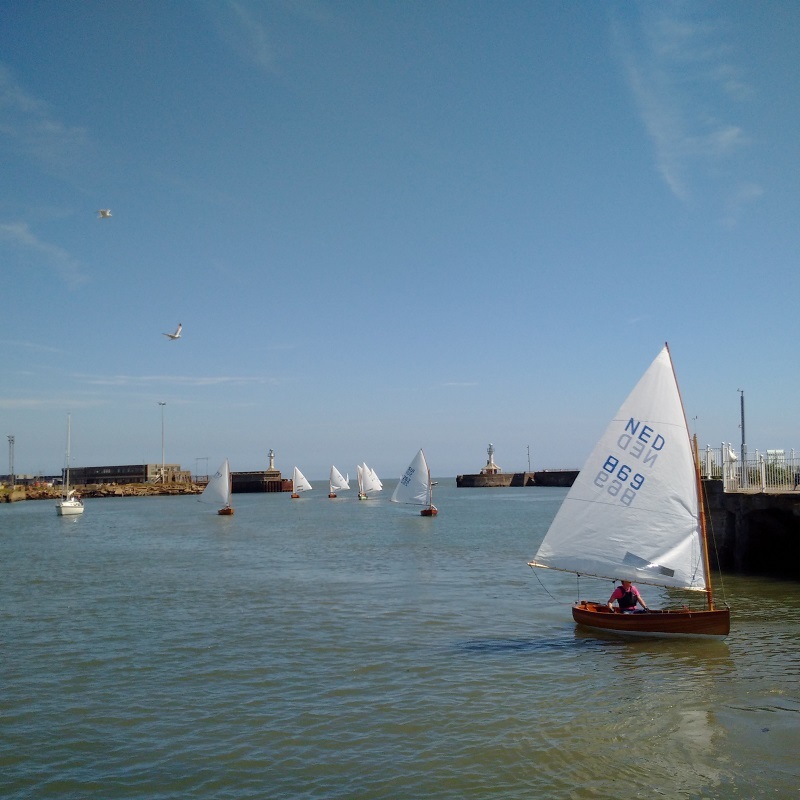 Unfortunately, we were then ‘descended upon’ by numerous 12ft International clinker-built gaff-rigged sailing dinghies who were having a rally and I was left alone in the channel for some time waiting for them to clear the harbour. Eventually the other craft joined me and, once an old MTB and two sailing vessels had cruised downstream under the bridge and past us, I led the fleet into Lake Lothing and up towards the railway bridge and Mutford Lock. We had some wait until the Railway bridge opened at 3.15pm and then, to everyone’s surprise, the lock-keepers called Lady Martina first into the lock ahead of all of the other craft; when we were due to be following everybody else! The other craft queried the lock-keeper’s messages but had to accept them and then I asked for instructions and, I was duly called to go forward and moor inside the lock. Now, the way that this old lock operates is that two boats are allowed in at a time but the lock itself is only able to manage one of them and so the pedestrian bridge is lowered, separating the two craft, the first is locked through and then the small bridge is raised again and the second one is locked through before another pair of boats are allowed in and the process repeated. We locked through, across Oulton Broad and then started up the River Waveney towards Beccles and we could still hear the lock operation instructions being broadcast on the VHF for some time afterwards, when all those boats were still being sorted out! We had been truly fortunate and the lock-keepers very wrong in calling us first but everybody has to follow instructions with nobody able to query things. I cruised very slowly at around 4 knots up the River Waveney and eventually arrived at Beccles Bridge to find that its fixed height would require us lowering our last after taking down the sun canopy and so we stopped short and looked for a mooring. Luckily, another boat was due to leave and left early for us and we found a good and safe (if rather noisy!) mooring just below the road bridge. Once we were settled, I led my ladies on a walk along the river and past the yacht station up into Beccles itself. By this time, the shops had closed but we just enjoyed looking at the buildings of this old market town as neither Kathleen or Ines had been here before. 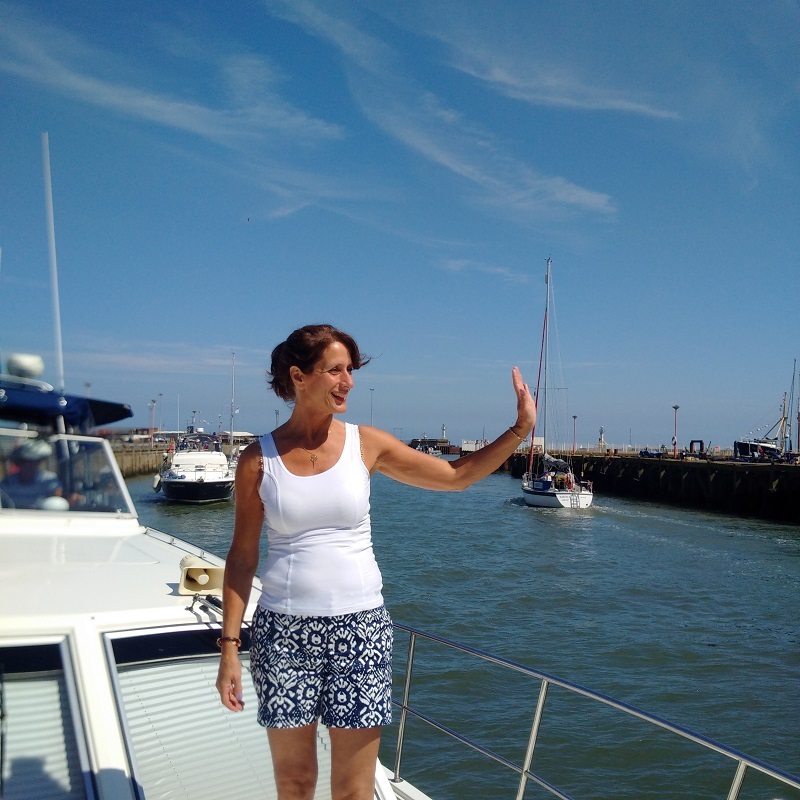 As we took a look around the Beccles yacht station, we met the couple from the BOC and their family, who were aboard Precious Time and were invited aboard for drinks and an interesting conversation. Back to Lady Martina, where Kathleen started preparing a fine meal of grilled salmon and boiled vegetables and Ines and I took turns in taking a shower aboard before we enjoyed the meal and Kathleen could have hers. By candle light, we played music and then I danced a little with both ladies until we just sat and chatted. Eventually to bed and to sleep to the sound of the traffic passing over the bridge at the end of a very enjoyable day.